PSU Library Special Collections invites you to a free forum on the exciting community and history projects stemming from the archival collections of Senator Avel Gordly and Otto and Verdell Rutherford. Politician and educator Avel Gordly and community activists and historians Verdell and Otto Rutherford are key figures in Oregon history. Their dedication to social justice, racial equality, and advocacy for the Black community is documented in the historical records they maintained and preserved. PSU Library Special Collections is the proud steward of the Gordly and Rutherford archives, which have served as vital resources for students, activists, historians, artists, and filmmakers, inspiring creativity and fortifying action. Please join us to engage with people and projects that carry forward the spirit and the commitment of Senator Gordly and the Rutherford family. After a series of lightning talks by invited presenters, all will have the opportunity to meet and exchange ideas for collaboration, mentorship, strategic action, and the creation and preservation of a representative historical record. 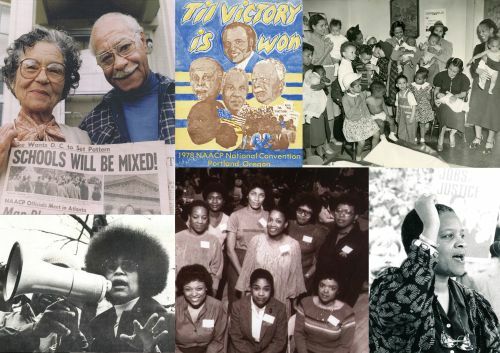 Come share common ground enriched by these important historical collections and consider how the history you are creating today can be preserved as a foundation for future action. Families are welcome! Refreshments will be served. For more information, please contact PSU Library Special Collections by email or phone at 503-725-9883. This event is hosted by PSU Library Special Collections with support from the PSU Diversity Action Council and the Office of Global Diversity and Inclusion.